I make delicious homemade cakes, pastries and shortbread fresh for small events, exhibition openings, meetings and private parties. Each sweet treat is made to order from fresh, locally sourced ingredients and lovingly baked on a narrow boat, currently cruising along the Grand Union Canal. For sizes, prices and delivery times, please get in touch with your details to chat about your requirements. Using a variety of tried and tested tasty cake recipes I make cakes fresh to order, including dairy free, gluten free and vegan. See what people are saying here. My shortcrust pastry using a family recipe is perfect for sweet or savoury nibbles. I make a mean vegetarian sausage roll and fruity jam tarts. 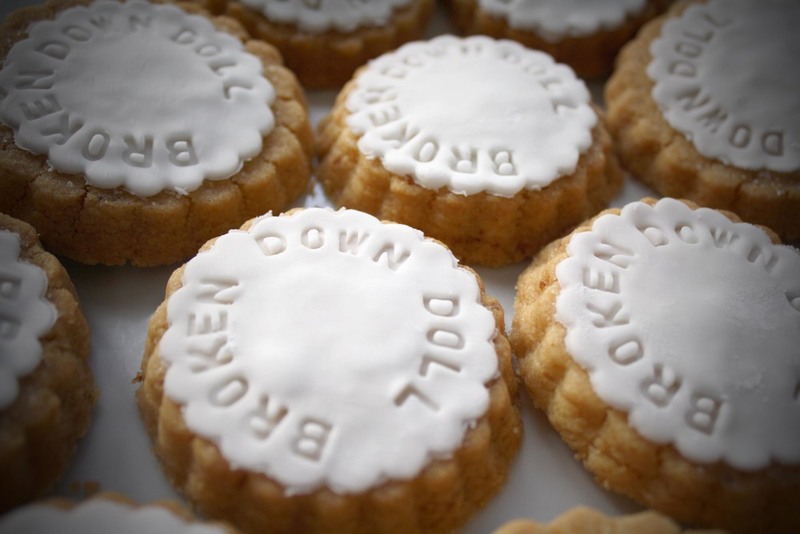 Impress your guests with some customised shortbread, suitable for events, pop ups, exhibitions, weddings and product launches. In 2016 I took on my biggest project to date… building my own home! 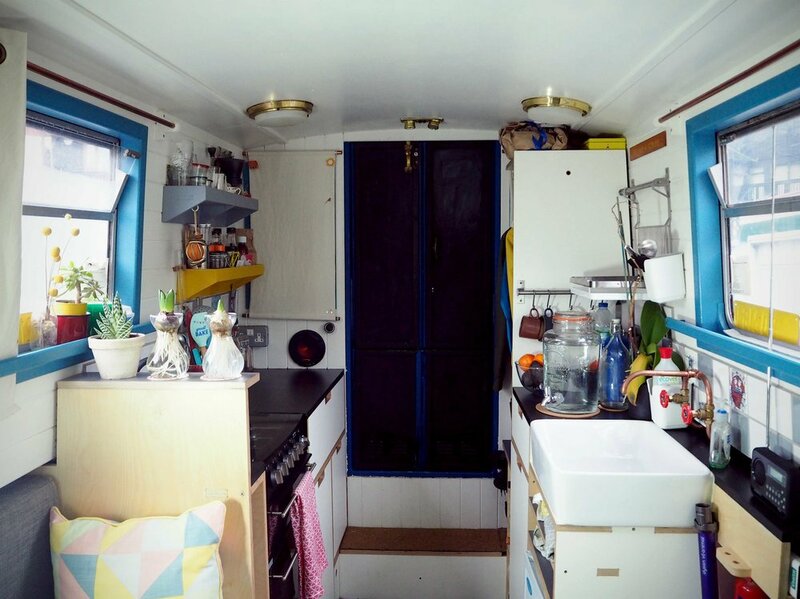 My partner and I spent a wonderful, emotional, busy, educational seven months transforming a dated narrow boat into our own little travelling haven. We gutted it out, designed and built furniture, took on plumbing, re-wired electrics, upholstered and did ALOT of painting, inside and out! I’m currently baking for small projects whilst we cruise along the Grand Union canal in London and eventually throughout the UK. I collaborated with artist Lucy Sparrow on her huge scale project, The Cornershop, the fluffiest shopping experience imaginable. After seven months of hard labour, Lucy filled a former derelict store in East London with over 4,000 handmade felt versions of everyday grocery items from cans of Heinz beans and tinned pilchards to newspapers and KY jelly. For the opening night I made lots of cakes and branded shortbread in limited edition felt packaging with sponsorship from Marriages Flour. I was super lucky to be a guest exhibitor at DRB's solo exhibition 'Firestarter' at Ben Oakley Gallery in May 2014. Using one of DRB's matchbox designs I appropriated some shortbread which was exhibited on a hand made flame mount alongside a collection of DRB's matchboxes. Commissions have included shortbread branding for a book launch, a Vintage pop up shop, souvenirs for a university in Tokyo, a charity pop up picnic, product launches and birthday and anniversaries gifts. Cake smash is a trend where newly turned one year olds get to play with and destroy a cake, whilst they have their photo taken. Remi turned one this year, so I baked a fat and sugar free-ish cake for the little man. Photography (and baby) by the wonderful Carole Evans. Over the summer of 2015, I was working in Weston super mare for Crust Conductor at Banksy’s most recent bemusement park and exhibition, Dismaland. I sold a shedload of homemade cakes, brownies and flapjacks and made delicious wood fired pizza all day, for 6 weeks. It was a fantastic experience in which I was very lucky to be apart of. I collaborated with artist Raksha Patel on a edible workshop at Pump House Gallery, Battersea. In response to the exhibition 'The Trouble with painting today', Raksha and I filled the project space with icing sugar, food dyes, chocolate fudge sauce and sweet ginger biscuits. Participants were let loose to use all available ingredients to make an edible painting on a biscuit or rice paper canvas. I was commissioned by Fourth Day PR to make christmas gift boxes for their clients. I screenprinted the labels, message and ingredients list, along with the reverse of the packaging. Each box contained a mixture of 14 biscuits, hand wrapped and baked with love in the depths of winter. I have had the pleasure of making wedding cakes, birthday cakes and cakes for sweet treat tables for special days in London, Windsor and Wales. These have included three layered naked vanilla sponge decorated with fruit and flowers, carrot cakes, lemon and polenta cakes, chocolate and orange sponge and a variety of gluten and diary free cakes and cupcakes. I was invited to create bespoke biscuits for the exhibition and book launch of Tipi di Bologna, a hand printed and bound book dedicated to the Italian typographic culture of Bologna City, designed and illustrated by Giulia Garbin. As the book is dedicated to print I decided to screen print onto shortbread biscuits. I used colours within the book to produce an edible ink using natural ingredients and screen printed onto white icing. The Viking Gallery opened in Kent with an exhibition titled South London goes to the Seaside. In response to a cycling trip last September from Camberwell to Margate I submitted 12 limited edition packaged shortbread hand decorated with bikes and sailing boats and screen printed labels. To mark the Tour de France going through London, I collaborated with illustrator Mayumi Mori on some shortbread inspired live mobile screen printing. Mayumi made a printing station which attached to the back of her bike and designed a cycling thaumotrope. She printed these on The Mall and we gave them out to spectators along with a piece of shortbread. Since my journey began in 2013 I am now baking in a very different setting! In 2016 I moved out of South East London to live and work on a narrow boat, based along the Grand Union Canal. 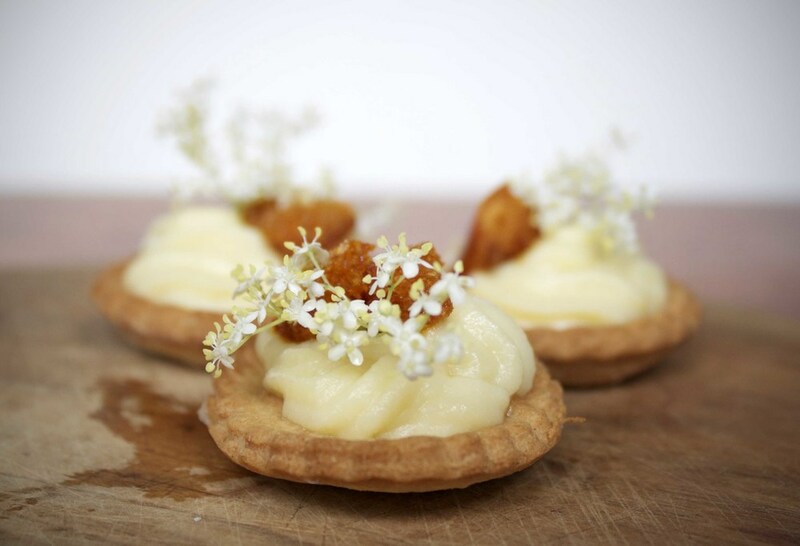 I create sweet treats for exhibitions, small events and private parties such as cakes for birthday parties and weddings, cinnamon rolls for workshops or meetings and branded shortbread for presents or events. I love to experiment with the food I make and have been involved with some exciting projects from facilitating a multi-sensory workshop exploring taste and smell to the Tour de France mobile printing collaboration. If you would like to collaborate on a project, or if you just want to say hello please do get in touch. You can email me using the form below. If you would prefer to chat over the phone just call 07986882502. Thank you! I will get back to you shortly.